UEHS Key Club is a service organization dedicated to helping groups and organizations in the community. Time spent helping others is invaluable and while a price cannot be put on time, supplies and other items do have a price. To help with funding, Key Club freshman Devyn France approached Jim Rollo, owner/agent of Jim Rollo State Farm agency about the need for funds for the club’s Annual Holiday Party. He offered to match, up to $500, the dollar figure students raised in money and gifts. The club collected $375 and Rollo’s agency matched it and submitted to State Farm to provide an additional match of $375, turning the clubs initial $375 into a total of $1125.00. Rollo presented the club with a check that will be used to help with supplies for the holiday party and other service projects. Rollo is a U-E graduate and he talked with students about reinvesting in the community and what it means to help others. Key Club members provide decorated pumpkins to residents of assisted living homes, make homemade dog biscuits for animal shelters, work at pasta dinners, participate in local walks and runs and spend hours working on their two biggest events; the Annual Holiday Party for U-E elementary students and bowling with ACHIEVE. 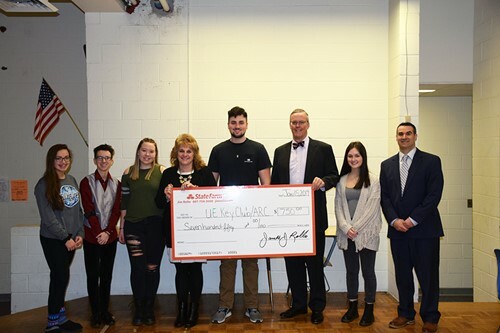 Businesses and individuals in the community have given thousands of dollars each year to assist Key Club. Every penny goes directly to providing services and needs to the organizations our students work with.